RCS is a freeware revision control utility. It allows you to manage software projects where several programmers are using the same files. Or you can use it just for unlimited backups. To get RCS, see the links at end of this page. These macros perform automatic check-in and check-out functions. Just create a sub-directory called RCS in your working directory, rest is done automatically. When you open a file which has been checked in, it will be automatically checked out, and when you close the file, it will be checked in. 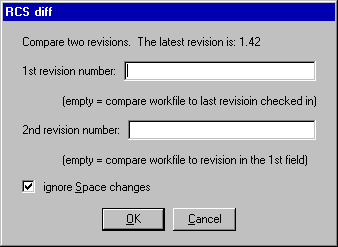 You can configure whether the checked in file will be read-only or if it is left editable. RCS_cmd.vdm displays a dialog box that allows you to perform some basic operations on your RCS files. RLOG and RCSDIFF refer to the file that is open in the current buffer when you call the macro. If no files are open, file open dialog box opens for selecting the file. The macros display the result in a window. From RCSdiff, you can go to the corresponding line in the actual file by pressing Ctrl-F11 (this calls the macro rdif_gto.vdm). I recommend that you put this in your User menu so you can easily start RCS from the menu and perform the commands. The C-User.mnu described in the C-programming page already contains the "RCS" option which calls this macro. rdif_gto.vdm: Go to line referred in RCSdiff output. This macro is run when you press Ctrl-F11 while in the RCSdiff output window. RCSdiff.syn - syntax highlight for RCSdiff. Displays different colors for removed lines, added lines and line number references. RCSdiff2.syn - alternate syntax highlight for RCSdiff. Displays removed lines in one color, while added lines are displayed with C syntax highligt. Rlog.syn - syntax highlight for Rlog (revision history) output. In addition, an instruction file RCS.TXT is included. The package is available as English and Finnish language versions. WinRCS - Windows front end to GNU RCS - Free for private use. RCS download, too.